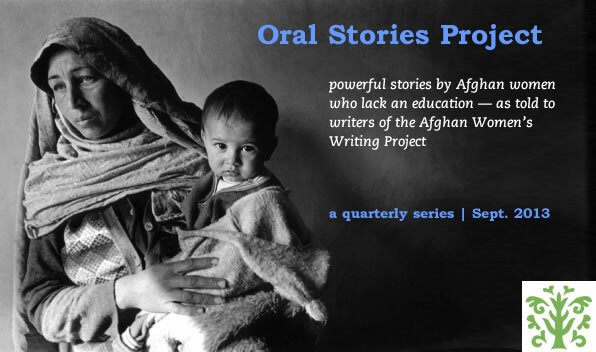 Masooma was born in Kabul, the sixth child in a family with eight children. Forced by the Taliban to stay indoors in the 1990s, she started a home-based business. In the name of God, my name is Masooma and I’m fifty years old. I was married at age fifteen and I have five sons and one daughter. Years ago my husband and I lived in Iran where my husband ran a small shop. It has been seventeen or eighteen years since we came back to Afghanistan. My husband worked in the Ministry of Agriculture, but after an illness he retired and now I am supporting my family with some tailoring and weaving as I used to do in Iran. When the Taliban didn’t let women go out of their homes, I worked at home knitting hats and jackets. When my sons were eleven and twelve years old they used to sell the products I made. Now my sons have their own jobs, but I like being busy so I weave tablecloths and knit jackets. When I was a child I had many nice dreams. I wanted to go to school, become a doctor, and work in hospitals. In those times fathers didn’t let their daughters go to school. They said education is not good for girls. When I was fifteen I got married and then I moved to Iran and got some education in reading and writing. My duties as a housewife are to wash dishes, vacuum, cook, and do the laundry. In my free time I knit and weave. I started my business after speaking with my husband about earning extra money. I made a knitting sign for our door. I didn’t want to ask my husband for money all the time, I just wanted to be independent. There are many problems for a woman who has children. As a housewife I wash dishes, vacuum, cook and do the laundry. When my children were young, breakfast, lunch, and dinner had to be ready on time for everybody, including my husband. I could do my work when all family members were asleep or during free time or in the early morning. It is important that family members encourage women if they want to have their own business. My husband and my sons help me sell my products. My husband encourages me in my business all the time. He says, “Instead of going to be educated it is good to stay at home and do the tailoring.” I do not sell my work every day, but people come to me to buy tablecloths or other products. Working has many benefits; it is good for the economy, and women learn from their experiences and teach others. By Masooma, as told to Fatima F.
Thank your for sharing your work story, Masooma. It is amazing to me that you found a way to keep working during the time the Taliban wouldn’t let you go outside. That must have been very difficult and I applaud your determination. Thanks for recording this, Fatima! Thank you for this story of hard work—and wonderful self respect. Your husband and children are very fortunate to have such a wife and mother! You should feel very proud of yourself. Amazing story. Here in America we take a lot for granted. But regardless of where you are, when the human will is ignited with a dream, anything is possible. Awesome story. Hi. your story is very inspiring to me. your family is very lucky to have you as a mother and wife. you are very hard working and have a lot of self-respect and dignity! you are an amazing women!! I found this to be truly inspiring and interesting, because Afghanistan has many restrictions on women’s rights. And being a mother of six and working to maintain her business while still being a housewife is true commitment. Although her husband and kids help Masooma maintain her business, I find it courageous that she went against the societal norms and showed her strength. I feel like Masooma is speaking out for all women and encouraging them to pursue what they want. They should not let fear stop them from doing what they enjoy to do, rather they should stand up for their rights as women.